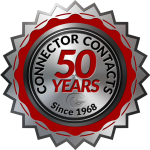 There are a multitude of reasons you should choose Connector Contacts to produce your next custom CNC machined parts order but we’ve outlined some of the most common reasons our current clients prefer our services over competitors below. With minimal overhead and experienced, efficient team members, we are able to quote out projects very competitively. With our quality management system (ISO 9001:2008) at the heart of our operations, we are easily able to achieve unsurpassed, outstanding product quality every step of the way. Advanced order tracking systems, daily production meetings, and detailed material and tooling inventory systems allow us to keep track of every order received to minimize delays and get your order produced and shipped to you in the least amount of time possible. Getting up to date information about your order is never hard. Give us a call during business hours and you’ll always find a friendly voice on the other end. No matter your concern, we always invite our clients to call with any questions they may have.